Our family has made the personal choice to observe Jesus Christ's birth every year by celebrating Christmas with family and friends. One of the traditions we have during this time of year is to decorate a Christmas tree. It is a special time of family togetherness, and a great time to reminisce. Every year when we decorate our tree, it is like taking a walk down "memory lane." Every ornament has a story to tell. Some were on our family tree when I was growing up, some are homemade, some are store-bought, and some were given to us as gifts. During the month of December, I will share some of my favorite ornaments with you and tell you why they are special to me. The original Shiny Brite* company was a producer of popular American-made glass Christmas tree ornaments. According to my mom, this box of assorted ornaments was most likely purchased at Woolworth's in Springfield, IL (a popular "five and dime" store) in the late 1960's. 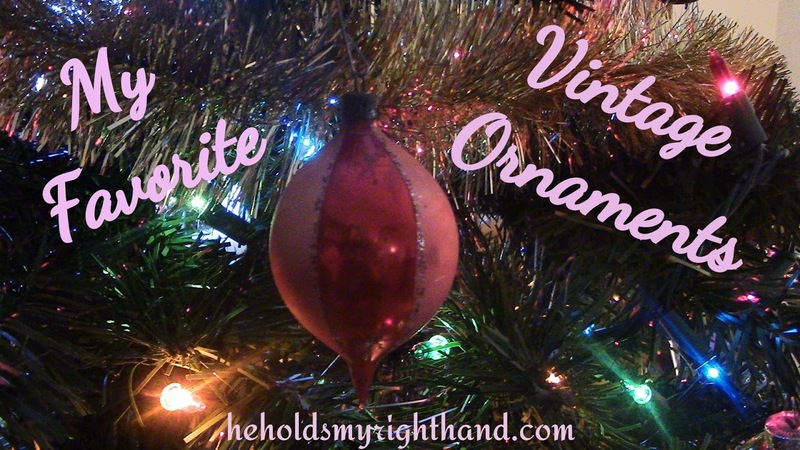 The ornaments are special to me because they were used on our family tree when I was growing up. I especially liked the teardrop shapes, like the one in the photo at top, and in the photo below. *You can read about the history of the Shiny Brite company on the Manchester Township website, under HISTORY. The blue one in this photo is my favorite out of the Shiny Brite collection. No real reason - I just like the color. And, along with this ornament, you can also see a painted bear made of wood. I remember helping my mom paint this bear when I was very little, maybe 4 or 5 years old. My brother and sister painted some of these wooden shapes as well. This one was a personalized metal angel ornament given to me by our dear friends, The Moores. It has been on our family tree since I was about 10 years old. It's always a favorite to hang up and remember the friendship we had (and continue to have) with the family who gave it to me. Here is a full look at our Christmas tree this year. Come back next Sunday to get an up-close look of some of the homemade ornaments that are special to me. John 1:14 - And the Word became flesh and dwelt among us, and we have seen his glory, glory as of the only Son from the Father, full of grace and truth.